Today ARM is announcing an update to their line of architecture license products. With the goal of moving ARM more into the server, the data center, and high-performance computing, the new license add-on tackles a fundamental data center and HPC issue: vector compute. 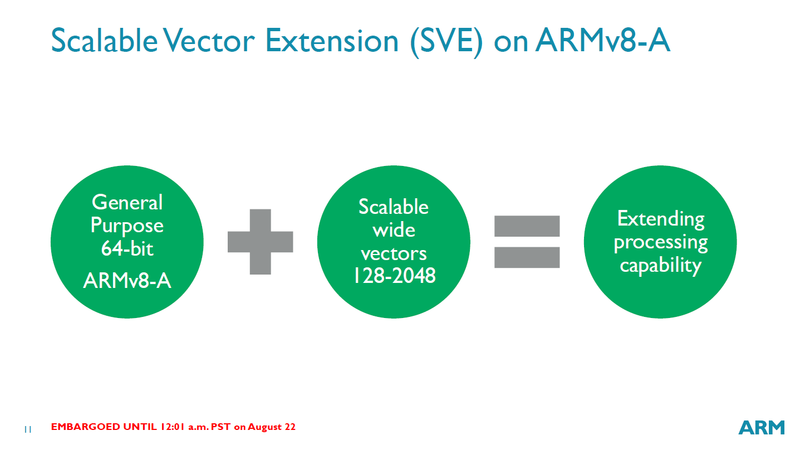 ARM v8-A with Scalable Vector Extensions won’t be part of any ARM microarchitecture license today, but for the semiconductor companies that build their own cores with the instruction set, this could see ARM move up into the HPC markets. 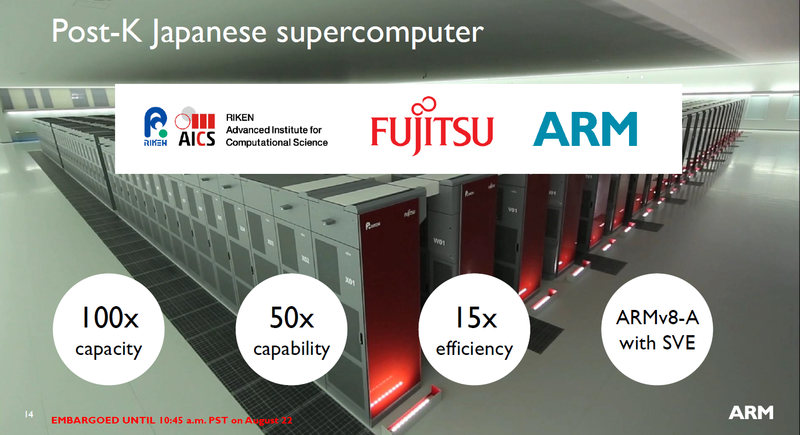 Fujitsu is the first public licensee on board, with plans to include ARM v8-A cores with SVE in the Post-K RIKEN supercomputer in 2020. 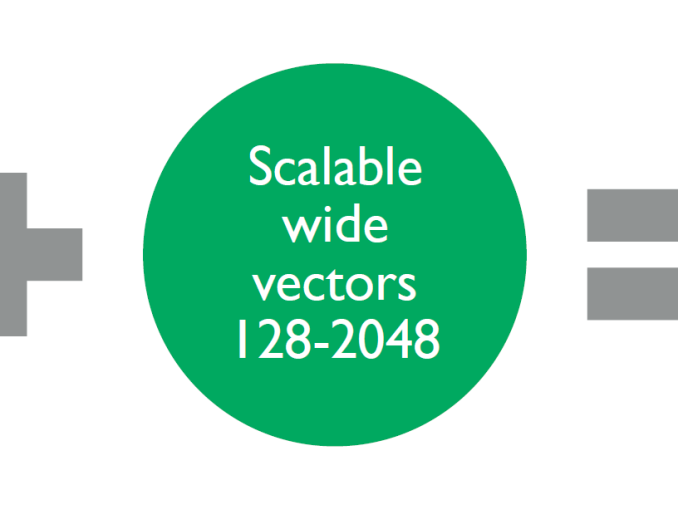 Scalable Vector Extensions (SVE) will be a flexible addition to the ISA, and support from 128-bit to 2048-bit. ARM has included the extensions in a way that if included in the hardware, the hardware is scalable: it doesn’t matter if the code being run calls for 128-bit, 512-bit or 2048-bit, the scheduler will arrange the calculations to compensate for the hardware that is available. Thus a 2048-bit code run on a 128-bit SVE core will manage the instructions in such a way to complete the calculation, or a 128-bit code on a 2048-bit core will attempt to improve IPC by bundling 128-bit calculations together. ARM’s purpose here is to move the vector calculation problem away from software and into hardware. This is different to NEON, which works on 64-bit and 128-bit vectors. 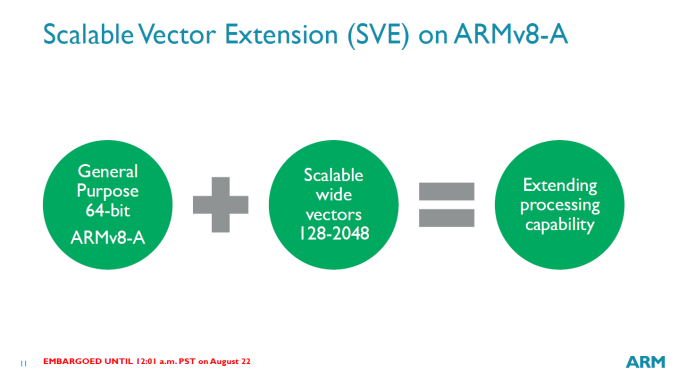 ARM is soon submitting patches to GCC and LLVM to support the auto-vectorization for VSE, either by directives or detecting applicable command sequences. Performance metrics performed in ARMs labs show significant speed up for certain data sets already and expect that over time more code paths will be able to take advantage of SVE. 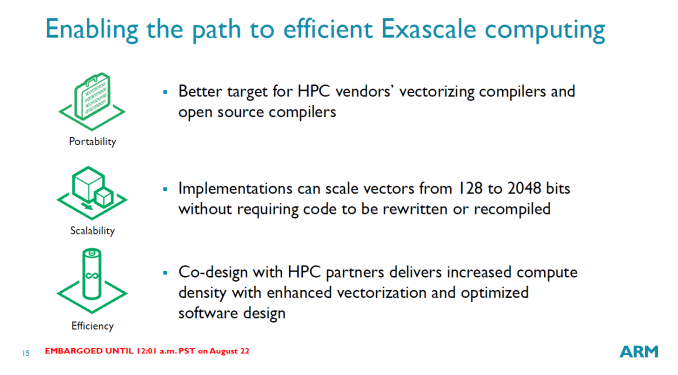 ARM is encouraging semiconductor architecture licensees that need fine-grained HPC control to adopt SVE in both hardware and code such that as the nature of the platform adapts over time both sides will see a benefit as the instructions are scalable. At 1st glance this sounds a lot better than the mess Intel created with the different tiers of AVX 512, and which they are not yet implementing into regular CPUs anyway. Optimization will require more work yes but getting code up and running shouldn't be more difficult. SVE also enables performance improvements with wider vector hardware with code targeting narrow units. On the x86 side of things, backwards compatibility is maintained with wider hardware but the additional width sits idle. From a programming standpoint, it almost makes more sense to always target 2048 bit wide vectors if the workload supports it. Granted there will be some overhead in splicing 2048 bit operations into smaller chunks vs. working with the hardware's native size. If the overhead is small (say <5%) that is a big win for both ARM and programmers. Cool stuff. I do think ARM's arrival in the cloud computing space is inevitable, although it should happen pretty slowly (maybe only a little faster than Intel conquering the mainframe space over the span of a few decades). Unlike in the consumer space where Microsoft failed hard with Windows RT (even though they're trying to get back to arch-agnostic UWP apps) and where Google has a fetish for Intel chips in Chromebooks for NO GOOD REASON, in the server space, service providers don't have such a huge lock-in with "legacy architectures", so they can transition more easily to ARM. That said, I hope ARM focuses more on security features going forward. They are needed for consumers, even more for cloud customers, and DIRELY needed for IoT, where ARM dominates right now. I don't feel like TrustZone is enough, especially when every OEM gets to use its own third-party closed source, full of bugs, "real time OS's" inside it. And by now there are better architectures, too, like Imagination's OmniShield, AMD's SEV, Intel SGX, and so on. I kinda loke google putting an i7 in their chromebook, since I can throw ubuntu on it and play steam games. Nobody else makes a premium 12 inch laptop these days. "as quickly as they pulled off the PowerPC -> x86 transition"